GAOTANG, China—Each morning, Li Xiuzhen packs her two children into her tiny electric car to get her daughter to school. With her youngest on her lap, there is just enough room. As the 36-year-old mom trundles into the morning rush-hour traffic, it becomes clear that an inordinate amount of people in this town of half a million people 200 miles south of Beijing drive similar contraptions, downsized electric vehicles too small and underpowered to be considered “real” cars. The taste for tiny EVs has become a quirky subplot in China’s push to become a world leader in electric cars. Roughly 1.75 million micro-EVs were sold in China last year, more than twice the sales of regular EVs, of around 777,000, industry executives estimate. Most of the tiny ones were sold in a handful of rural provinces. The market is still growing rapidly, with some 400 Chinese manufacturers building countless models. The government has lavished subsidies on Chinese EV makers. But the micro-EVs beloved in the countryside—cheap, slow and extremely low-tech—aren’t what Beijing’s mandarins had in mind. Indeed, many Chinese cities, including some near Gaotang, have banned them entirely, encouraging people to buy full-size EVs instead. It’s hard to imagine that working out in Gaotang, which some see as the home of the low-speed EV. The tiny cars’ detractors have two main gripes: They typically use cheap lead-acid batteries, which are bad for the environment, and they have no crash protection. The central government is now looking to impose some order by legitimizing higher-quality low-speed electric vehicles, or LSEVs, and banning inferior ones. Draft regulations last year defined a micro-EV as having a top speed of 25 to 43 miles an hour and stipulated weight and size limits. The draft rules also called for crash protection and required the use of lithium-ion batteries. 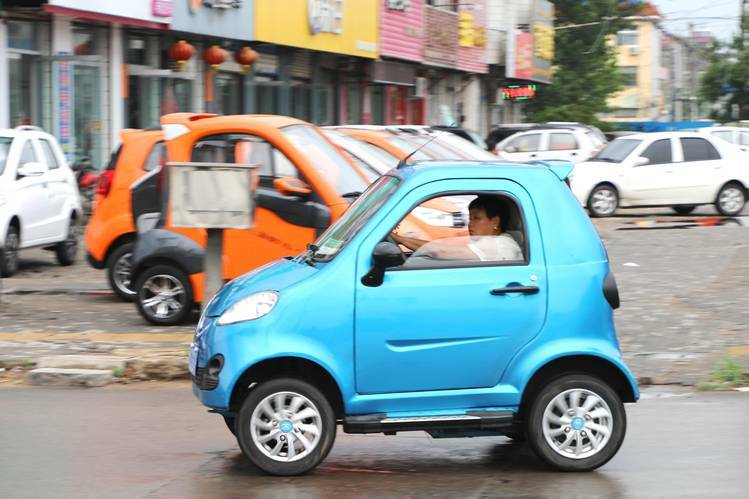 Micro-EVs are a common sight on the roads of Gaotang.
. The comparison ends there, however. Smart cars, which can top 95 miles an hour, sell for about $15,000 and have advanced safety features, whereas the slow-moving mini EV’s start at under $1,000 and lack any kind of crash protection. The tiny cars have another big advantage over full-size vehicles, said Liu Fayang, chairman of Jiujiuxing, a micro-EV maker based in Gaotang: You don’t need a driver’s license to squeeze behind the wheel. “So if your driving skills are lousy, that’s no big deal,” he said. Occupying a legal gray area between scooters and cars, micro-EVs are able to use both roads and bicycle lanes to weave through traffic. Riding a small car in a bicycle lane certainly feels safer than being exposed on a bike or scooter, but on the road it’s a different story: Full-size cars and trucks swerve round the slow-moving battery cars, horns honking and lights flashing. Gaotang’s economy, like its residents, depends on them. A dozen mini-EV producers are clustered in the Shandong province town, which until recently was better known for producing paper and cooking oil. Jiujiuxing builds a mini-EV for every need. There’s a miniature firetruck, a pint-size police car, and various minuscule passenger models starting at $1,000. A peek inside the company’s no-frills factory helps explain the rock-bottom prices: Workers fish parts out of huge cardboard boxes overflowing with wing-mirrors, wipers and steering wheels and then assemble the vehicles by hand, with not a robot in sight. The tiny cars’ rise has created a tricky dilemma for China’s leaders: how to enforce vehicle standards without pricing ordinary people out of China’s electric-car revolution. “This is what ordinary people want,” said Wang Shihong, founder of micro-EV maker Hongdi, standing proudly next to one of his creations, a white toylike machine with a $1,100 price tag, gift-wrapped in a flamboyant red rosette. That way of thinking makes China’s big auto makers flinch, as they invest billions in real EVs. “We all know the big EV companies are lobbying against us because we’re eating their market,” claimed Mr. Wang. Crushing the plucky micro-EV business would be grossly unfair, he said. But for officials, the microcars are a throwback to the old China of low-tech, low-end producers—an image the government is desperate to change. The industry also does little to dispel the image of China as a country of poor trademark protection. Jeep Mopor salesmen demonstrate the robustness of their vehicle by standing on it. a midget Mitsubishi and two dodgy Fords, as well as one EV outfit called “Jeep Mopor”, not to be confused with the U.S. Jeep and Mopar brands. 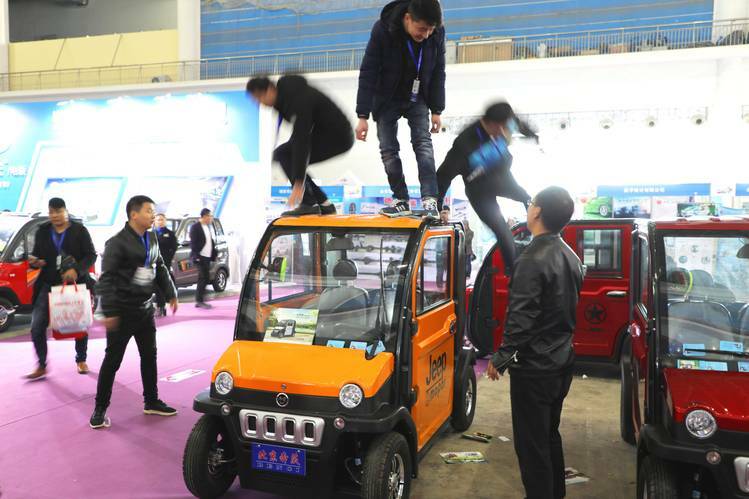 “Jeep Mopor is a legally registered trademark,” said sales manager Liu Yanzhu, though he laughed as four men stood on the bright orange microcar’s roof, bouncing up and down to demonstrate the machine’s sturdiness to skeptical onlookers. Impressively, the downsized “Jeep” didn’t buckle. Despite some rough edges, the tiny EV makers are onto something, auto analysts think. “Even in big cities there’s demand,” said Jeff Cai, general manager for auto products at J.D. Power China, since micro-EVs are easy to park—up to three of them can fit in one parking space—and can zip through heavy traffic. For short-range commutes, many people are figuring out that they offer greater convenience than a full-size car at a fraction of the cost, Mr. Cai said. His suggestion: Improve, but don’t kill, the micro-EV sector through light-touch regulation. —Xiao Xiao and Yang Jie contributed to this article.